Building a good credit score is important if you want to get approved for the best travel rewards cards. Today, TPG Contributor Richard Kerr explains the significance of your FICO score, and which credit cards can help you track it to better maintain your credit rating. After a Social Security number, a FICO credit score is perhaps the most important number assigned to Americans, yet many people don’t know what that number is or where to look for it. In this post I’ll explain why your FICO score is so important, how it’s calculated, and how you can stay informed by taking advantage of the rapidly expanding list of credit cards that offer your score for free. Your FICO score is instrumental in how financial institutions view your credit-worthiness. Your FICO score (a product of the Fair Isaac Corporation) is the foundation of most financial transactions you make. If you want a loan at competitive interest rates, want to be approved for a credit card, or want to pass a background check, you need to have an acceptable FICO score. Knowing your score can help you anticipate what to expect from these kinds of transactions. Your FICO score isn’t static; it evolves with your finances, and you can improve (or damage) it depending on your degree of fiscal responsibility. That’s important because it means you can cultivate a high score over time with good financial habits, even if you have bad credit (or no credit). Your FICO score allows you to track the state of your finances, and can alert you to any problems (like a missed payment or identity theft). Knowing your FICO score is helpful when it comes to travel rewards, because it can give you a sense of which credit cards you’re likely to be approved for, allowing you to maximize your applications. The FICO formula is kept private, but we know the factors that affect your score. Image courtesy of Shutterstock. The factors that affect your score the most are late or missed payments and your credit utilization (the ratio of how much credit you’re using to how much credit is available to you). Length of credit history also affects your score, so it makes sense to keep your oldest accounts open unless you have a compelling reason to close them. Negative remarks (like a late payment or accounts in collections) stay on your credit report for 7 years. That’s a long time to pay for a mistake and have it be an obstacle to earning points and miles. Fortunately, negative remarks affect your score less and less as they age. Plenty of credit cards offer some version of your credit score for free. The good news is that accessing your FICO score for free is now easier than ever, thanks in large part to the Fair Isaac Corporation launching its FICO Score Open Access Program. This program allows credit card issuers that have already purchased the FICO information to share it with customers at no additional charge. The following credit card issuers now offer your FICO score for free, either online or with your monthly statement. American Express is now providing its cardholders with not only an educational FICO score, but also their Fico Score 8. This number is the credit score the issuer uses to manage cardmembers’ accounts, and is based on data from major credit-rating agency Experian. Current cardholders can log into their accounts and access their score on the right side of the screen. Amex recently announced that all cardholders will receive their FICO score for free. Barclaycard provides you with a TransUnion FICO score for free on your monthly statement, either online or by mail. Barclaycard also informs you of changes to your credit score via email alerts. Cards that offer this feature include the Barclaycard Arrival Plus World Elite Mastercard, AAdvantage Aviator Personal Cards and Hawaiian Airlines World Elite MasterCard. Barclaycardus.com shows my score in number and graph format, as well as the last 12 months of my score history. Chase has hinted several times it will begin offering FICO scores to all customers in 2015. So far, only Chase Slate cardholders have been given the new benefit. The Slate card doesn’t earn rewards, but does offer a 0% intro APR on balance transfers and purchases for the first 15 months after account opening (then 16.99%–25.74% variable). Citi allows you to view your scores online if you have certain Citi-branded cards, including the Citi ThankYou Preferred, the Citi Premier Card and Citi Prestige. Fewer co-branded Citi cards offer this benefit, but the Citi AAdvantage Executive World Elite Mastercard is among those that do. Capital One provides you with the non-FICO TransUnion Educational Score and credit report summaries as part of a free service called Credit Tracker. You can access this interactive tool both online and via a mobile app, with cards like the Capital One Venture Rewards Credit Card and Capital One Quicksilver Cash Rewards Credit Card. Capital One’s interactive Credit Tracker tool is available to cardholders online and via this mobile app. Discover provides you with a TransUnion FICO score with each monthly statement. Cards that come with this perk include the Discover it® Cash Back, Open Road, Motiva, Miles by Discover and Escape by Discover. First National Bank of Omaha allows cardholders to see their score online for free. U.S. Bank provides you with your Transunion credit score and 2 years of credit history with the bureau via a service called CreditView. If you’re a U.S. Bank cardholder, you’ll need to log in to your U.S. Bank account and click through to your statement via the Check Your Credit Score for Free link on the left side. 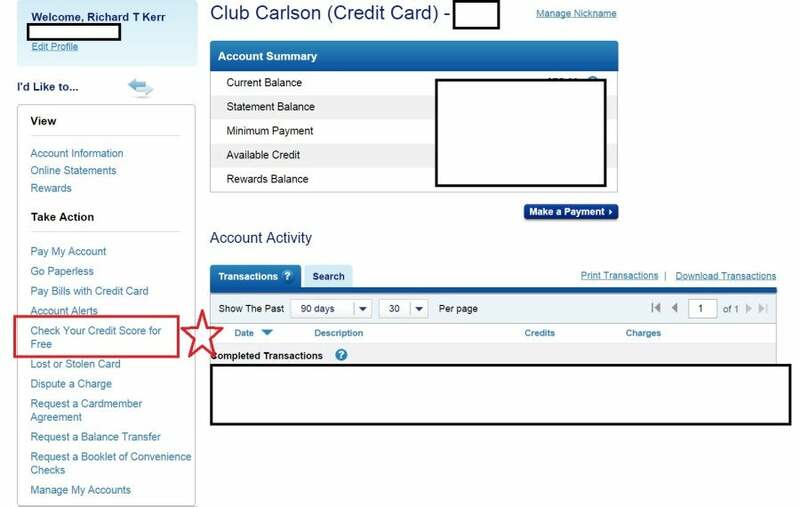 The red box on the left shows the link that leads cardholders from the U.S. Bank site to Experian. You’ll be informed that you’re leaving the U.S. Bank site, and will be directed to the Experian site, where you’ll have to register your name and email address in order to be shown your score. Several U.S. Bank-issued credit cards give you access to your score, including the Club Carlson Premier Rewards Visa Signature. 1. Citi Premier: TPG has covered the rise in value of ThankYou points extensively this year. Earlier this year, Citi increased the sign-up bonus to 50,000 points after you spend $3,000 in the first three months. You can combine ThankYou points with anyone, meaning if you sign up with a friend, spouse or other travel companion, you could have 106,000 ThankYou points (after meeting the spending requirement) to transfer to a travel partner or redeem toward plane tickets (which earn frequent flyer miles) at 1.25 cents/point. The Premier card earns 3x ThankYou points on all travel including gas, 2x points on dining and entertainment, and 1 point per dollar on all other spending. 2. The Platinum Card from American Express: The standard sign-up offer is for 40,000 points after spending $3,000 in the first three months, but my wife was just approved for a targeted 100,000-point sign-up bonus. This offer is sometimes available through the CardMatch tool or by calling Amex with a special offer code. As active duty military, both she and I get the $450 annual fee waived, which means we get generous benefits like airport lounge access and a $200 airline fee credit absolutely free. 3. Barclaycard Arrival Plus World Elite Mastercard: Even with the recent negative changes, this card gives you an effective return of 2.1% cash back on all spending toward travel-related expenses. These miles are great for wiping out charges that other travel rewards programs don’t cover, like Airbnb or taxis.